Kickstarter Alert: The Choir, "Calling All Monkeys"
Rounding the last turn of their Kickstarter campaign, alternative rock band The Choir is setting out to make their fifteenth record. 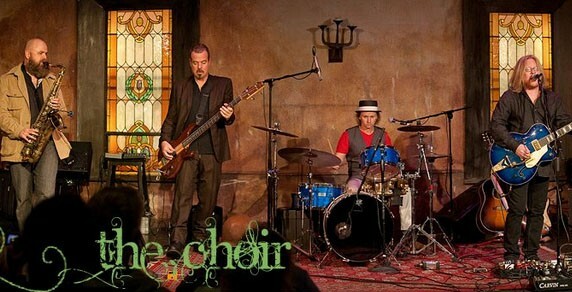 Helmed by singer/guitarist Derri Daugherty, drummer/lyricist Steve Hindalong, bassist Tim Chandler and saxophone/lyricon player Dan Michaels, The Choir has steadily been making albums since the 1980s, with several independent releases of the past decade being funded by preorders and crowdfunding from a loyal fanbase. However for this latest project, all the people in the band are reaching out for a bigger budget, a wider field of contributors to the performances, and are hoping you will participate in the last 13 days of the campaign. The good news is that the project is already funded, so your pledge is secure and you can count on the completion of the album and of receiving the packages you choose. The bad news is that several people in the Popdose audience haven’t a clue about what The Choir sounds like. Rather than fiddle with analogies and fumble for what bands are in The Choir’s wheelhouse, Daugherty, Hindalong and Co. have made a collection of tracks available. Find out for yourself by downloading this band-authorized mixtape by clicking here, and then head over to their Kickstarter page to contribute to The Choir’s Calling All Monkeys fund. You can reach their campaign page by clicking here.